The Danish toy company has teamed up with Airbnb to allow one family to stay the night at its new attraction. It's a 129,167 square-foot building filled with 25 million colorful plastic bricks. There's a parents' bedroom. It features a Lego cat, slippers and a coffee pot. It even has a newspaper made from the bricks. There is a children's bedroom. It has a Lego teddy bear, lamp and story book. Towering above the child's bed is a 20-foot tall Lego brick waterfall. It is surrounded by a seemingly bottomless pool of - you guessed it - Lego bricks. "What I do as a job is I actually make the products that you can buy at the toy stores," says Lego design manager Jamie Berard. "So, to do something like this outrageous waterfall or to recreate a bedroom out of what is currently not really a living space is a wonderful challenge." The promotional effort comes as the company tries to revive its sales, which are falling for the first time in 13 years. Lego said in September it was cutting 1,400 jobs, or eight percent of its workforce. 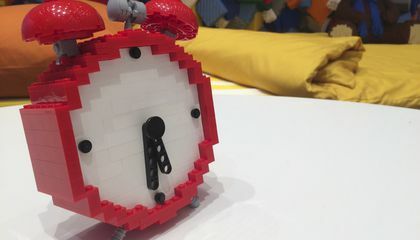 Those who want to join Lego's private sleepover must enter a competition and describe what they would build if they had an infinite supply of Lego bricks. The winner will get the chance to create their entry under expert supervision, as part of their stay. Designed by Danish architect Bjarke Ingels, Lego House opened in late September after four years' building work. The attraction is located in central Billund, a small town in Danish Jutland where the toy company is headquartered. Towering at the building's center is a 15-meter tall Lego brick tree, named the "Tree of Creativity.” It took over 24,000 working hours to construct. Made from over six million bricks, it charts the gradual evolution of the toy company's creations. The competition launched last Thursday and is set to run till mid-November. The winner's family will visit Lego House on Nov. 24. This isn't Airbnb's first sleepover contest - last year, it invited people to spend a night next to the shark tank at Paris Aquarium and at "Dracula's castle" in Romania. It was the first time Bran Castle welcomed overnight guests since 1948. The Lego experience is rather tame by comparison, unless barefoot visitors should unwittingly step on a stray Lego brick. Adults are advised to wear Lego-proof slippers just to be safe. "I wish I was the one that could just sleep in here," says seven-year-old Albert Landbo, who was visiting with his brother Gustav and their parents. Asked what creation he proposed for the competition, he said: "I think I would make a little baby husky." Why did it take four years to build the Lego house? I think it is so cool that they are letting a family have this opportunity. Having a sleepover in a lego house is so cool! They are such hard workers for working on this for four whole years, that is a long time. Also making the guest feel at home with home made like beds to sleep on with an alarm clock, teddybear, newspaper and more. I think something like this would be fun to build and fun to be inside of. I think this would have taken about 7-10 days to build but in my opinion it would be worth it because who wouldn't want to spend the night in a lego house. I love this! Really interesting and good idea by LEGO. This is so cool and creative. 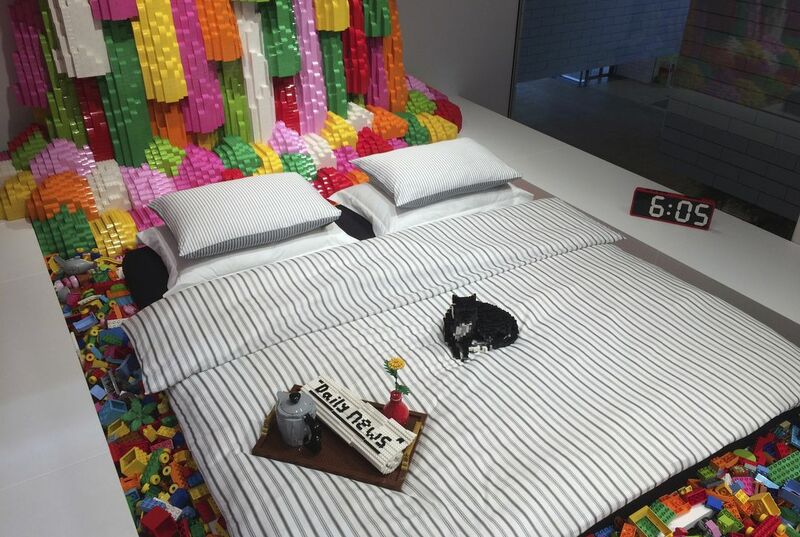 I don't think that I would be able to build this Lego bedroom. I do not have the energy to build it. Would you want to build it? I would as long as there is no deadline for it to be done. I need to go there it sounds so cool! because the house you are available to actually stay. you are available to spend a night with your family of course you cant live there but maybe a one night stay would be good. From personal experience I know working with legos can be difficult. They're tiny, pointy, and overall just hard to work with. I can barely put a lego car together in two hours, I can't imagine building a house out of legos in four years! I think it took them so long because a house is huge and legos are tiny. In conclusion, building a house with legos is a complex, tedious job that can take four years.